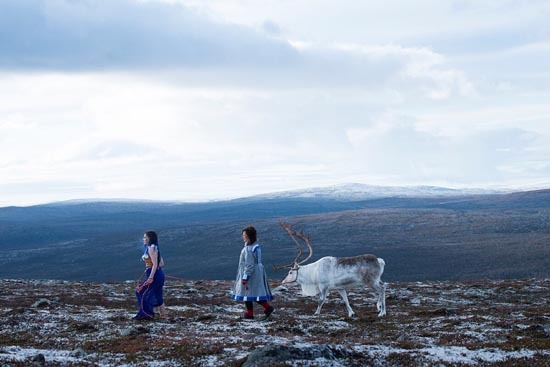 The Saami (Sámi) are an indigenous people of Northern Europe who pursue, at least in part, a traditional lifestyle still based on reindeer herding, and other resource-based lifestyles. With more than 130,000 people spread primarily across northern Norway, Sweden and Finland, as well as Russia (making up Saapmi or the Saami homeland), their music recalls, at least to this listener, elements of other nomadic cultures from Northern Canada to Mongolia. 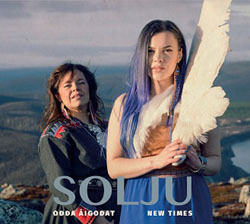 On this new recording, Solju combine elements of Saami music (the yoik or acapella song-chant) with both modern synthesizer and rock guitar, as well as orchestral accompaniment, on 11 strong tracks. Vocalists Ulla Piirtjärvi and her daughter Hilda Lansman combine ancient, modern and even classical sounds on this new disc, accompanied by Samuli Laiho, (programming, synths, guitars, glockenspiel, piano) and Tejo Majamäki (percussion, vibes, hang). This is an exceptional opening track, one which leads into the much more traditional "Aimejoga Jovnna," a yoik about a man who used to drive his boat across a lake close to where the singers live. “Heargevuoddji – Reindeer Driver” with its driving yoik and percussion invokes a lonely life driving reindeer on the ice, “The reindeer strides, and the sled flies, across lowlands, highlands, the adorned reindeer trots along,” but the chorus reminds me a bit of modern English or Welsh pop, with the use of harmonies and synthesizers. “Beaivi Áhčči -Sun Father” is an example of what one might call “reindeer rock” with a heavy guitar riff by Laiho, a strong lead vocal by Pirttijarvi, but lots of yoik as well. “Irgeávnnas – Boyfriend-to-be” features throat singing by Mikko Neovonen, is evocative, reminding me of Mongolian and other indigenous sounds. With piano and orchestra, and synth “Davvebiekkat -North Wind” really fuses Saami traditions with British pop styles, but the lyric is really expressive, strong, Saami: “The demons are about to get you, you have to listen to your senses, and let the North wind sway you.” Completing the vibrant album is a yoik by Landsman, “Áille Luohti”. The CD booklet contains lyrics in both the original Saami language and English, a nice touch always provided by their record label, Bafe’s Factory of Helsinki.